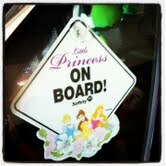 I swore up and down I would never be that mom with a "Baby on Board" plaque on my car. Pretty much since the day I found out I was expecting, my dislike for bad drivers has quadrupled. I have admittedly become the hyper-anxious mom who explains to you (as if you can hear me) that I am carrying my most precious cargo in this vehicle so please slow down/use your blinker/stop texting and driving etc.! What can I say, being a mom changes you in ways you can't explain. hahhaa, too funny! i have a feeling that would be me too ... i think it's true what they say, never say never.